Roman Poboinyi was born in 1990 in Shostka (Ukraine) and at first studied medicine in his hometown. From 2010-2015 he started his singing studies at the National Music Academy of Ukraine in Kiev with Prof. Alexander Vostriakov. During this time he studied roles such as Lenskij and Triquet („Eugene Onegin“), Lykov (Rimsky-Korsakov’s „The Tsar’s Bride“) and Eduardo (Gioachino Rossini’s „Il cambiale di matrimonio“). 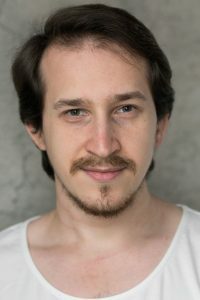 In 2015, he moved to Germany to continue his studies at the State University of Music and Performing Arts Stuttgart with Prof. Georg Nigl for his master’s degree in opera. In several productions at the university he sang roles such as Hoffmann in „Hoffmann’s Tales“ (divided part), Rinuccio in „Gianni Schicchi“ and il Duca di Mantova in „Rigoletto“. In the 2016/17 season, Roman Poboinyi took over the role of Verdi’s »Rigoletto« and Don Curzio in Mozart’s »Le nozze di Figaro« at the Stuttgart Opera. In Balingen he sang Rodolfo in »La Bohème«. For the season 2017/18 Roman Poboinyi began his first engagement at Theater Augsburg. There he currently sings Tamino in The Magic Flute, Nikita Khrushchev in JFK, Ernesto in Don Pasquale and Wietek in Dalibor.